We can’t believe that camp is only one day away! The madrichim have been working tirelessly to prepare for this coming summer. As ראשי עדה (unit heads) of Gurim, we are excited to see what this summer has in store. As we embark on our 11th and 13th summer at Machaneh Yavneh, we anticipate that this will be our favorite summer yet. Our צוות (staff) has amazing רוח (spirit) and great ideas for activities. We are also fortunate to have three members of the משלחת (counselors from Israel) to bring Israeli culture and Hebrew learning to all of our chanichim. Staff Week began with all the roshes heading the Browne Center, an outdoor leadership training in New Hampshire. There we bonded as unit heads and learned games to bring back to our צוות (staff) and חניכים (campers). Once all the counselors arrived, we spent time preparing bunks and planning פעולות (activities). On Friday, the Browne Center came to camp and spent the day with us. Our group leader facilitated activities to bond the Gurim צוות (staff). Shabbat at camp was very relaxing and ended with an energetic Havdallah. Sunday we had an all tzevet campout at sadeh yarok (where you’ll be parking on Wednesday). All of the madrichim were split up into tent pitching, dinner preparation and fire pit groups to review the essentials for our campouts over the summer. The night ended with singing around the campfire. 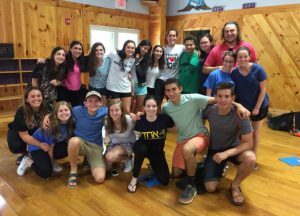 In addition, while we’ve been preparing for the summer during staff week, the madrichim have been reflecting on their own camp experiences at Yavneh. We collectively have had such positive memories of the uniqueness that is Yavneh and hope to bring the same positivity we experienced to our chanichim this summer. Can’t wait to see all of you Wednesday!